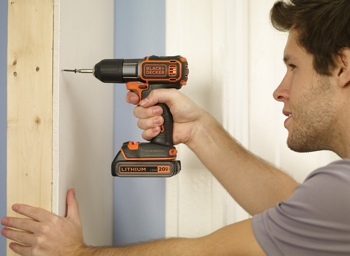 Black & Decker today announced its new 20V MAX Lithium Cordless Drill with Autosense Technology, a hand-held, battery-powered tool with a precise electronic clutch that automatically stops the drill when a screw is flush. Unlike traditional power drills, the new Black & Decker with Autosense comes with a special microprocessor-backed ‘drive mode’ setting. In drive mode, the drill continuously measures its torque and rate of speed to know exactly when each screw is perfectly flush. The drill also supports micro adjustments, so you can countersink screws just as easily without any damage to your drilling surface. The 20V MAX Lithium Cordless Drill with Autosense Technology will be arriving at Home Depot, Lowes, Amazon.com and Walmart.com sometime in May or June 2014 with a MSRP of $79.99. For more on the drill and its new Autosense Technology, check out the Black & Decker website or the short promotional video below. For other cool high-tech home improvement items, check out our home tool coverage.